The first item on the menu today is Sound Sprocket’s PA-1 – these are beautiful in-ear headphones that offer plenty of noise isolation, and the reason we picked them is because they’re small, compact, and provide excellent quality of sound. The bass response they offer is excellent, the midrange is pronounced while the highs are as crispy as can be. They’re very comfortable as they boast hypo-allergenic materials, including silicon rubber twist-locks, as well as enhanced comfort foam tips that provide even more acoustic isolation. Lastly, PA-1 monitors feature micro drivers that are on par to drivers only boutique-level headphones are outfitted with. The difference, however, is that this model isn’t as expensive. 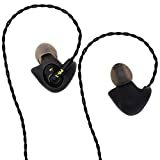 First of all, we really liked how these earphones performed for the buck – usually you’d expect little of budget headphones, but these provide excellent sound quality and isolate nearly 100% of the ambient noise. Those are but a few things we liked – we were amazed by the comfort snug fit and their overall practicality as well. The flimsy build of the cable is the only thing that doesn’t really add up here – everything else is either great or near-perfect. Drummers usually need plenty of sound isolation, especially if they’re hitting the kick hard. These headphones provide just that and don’t cost too much in turn. Definitely worth considering, to say the very least. HAS-10 is next on the list – we’ve just seen what in-ear headphones should be like, and now we’ve decided to recommend an over-ear set for people who prefer this headphone type over the former. The HAS-10 comes outfitted with powerful neodymium drivers that provide a huge dynamic range. 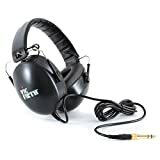 They’re quite comfortable overall due to squishy earpads and the headband made of leather while the ear shells are made of highly durable aluminium. These headphones are exquisitely durable, and that’s a major understatement. The leather headband and ear shells made of aluminium are more than enough to back up that statement. Furthermore, the drivers are very strong and provide high-fidelity sound, as well as impeccable ambient noise reduction. Truth be told, LyxPro HAS-10 comes packed with a plethora of features, but they’re not perfect. 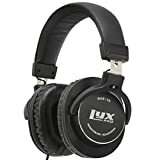 They’re just slightly less comfortable than average over-ear headphones due to their bulky design, but they make up for this little flaw with excellent performance and durability. If you’re looking to sport a high-quality drummer headphone set that will last for a while, HAS-10 is a safe bet. These headphones don’t cost much and boast excellent performance for the money. KTUI26 Ultra isolation headphones are absolutely great for drummers and percussionists who’re performing live. They feature a shortened headband and oversized earcups which combined provide outstanding ambient noise reduction and excellent comfortability. The external noise isolation is passive, hence you won’t need any batteries to begin with, but what’s really great about this feature is that you’ll be able to negate up to 26 decibels of ambient noise while wearing them. The overall construction is pretty sturdy, and it’s safe to say that these headphones are among the lightest in this review. Practicality and comfortability of these headphones, atop the given ambient noise reduction are the most notable things you’ll grow to love about Kat’s KTUI26 headphones. The earcups feature padded foam cushions that ensure maximum comfort, and they’re not even that expensive. While the overall construction of these headphones is pretty robust, there’s a rubber part at the joint between the earcups and the wiring that’s very flimsy. We encourage you to expect a lot from these headphones – even though they’re not boutique level, they provide excellent sound quality, outstanding noise isolation, and they will last you for quite a while given proper maintenance. In truth, Vic Firth’s Stereo Isolation headphones are pretty versatile. They are intended for studio and musicians who perform live, drummers included as they boast next-level sound isolation. The oversized caps are padded and feature gentle foam cushions that prevent the ambient noise from reaching the wearer’s ears while providing as much comfort as possible. While we’re at it, these headphones also self align once you start wearing them, ensuring perfect fit at all times. The quality of sound is pretty great and the overall soundstage is well-rounded. The reason why we’ve picked these headphones for our fellow drummers is because they offer a tremendous level of ambient noise reduction. The earcups are huge, and the foam cushions are very big and broad, so you can rest assured that you’ll only hear as much as you want to. On top of that, the sound quality isn’t lagging behind – with a perfectly balanced soundstage, they sound awesome, to say the very least. Lastly, these headphones are very versatile. Even though we’re mainly speaking about headphones for drummers who perform live concerts and gigs, this model will be valuable for virtually every musician, be it a bass guitar player, a guitarist, or even a violin player. Even though these headphones self align as soon as you start wearing them, most people point out that they’re not so good for people with “bigger heads” in a sense. Notably, the headband isn’t fully adjustable, let alone stretchable, probably due to the self-alignment mechanism. These headphones are perfect for drummers who perform live – excellent sound, versatility, and durability are just some of the benefits they bring to the table. However, they’re not for drummers with bigger heads. We’ve saved Shure’s SE215-CL for last, and we’ll feel comfortable enough to dub them as one of the best headphones for drummers. Even though they are a bit more expensive than most models we’ve reviewed so far, they excel in virtually every field of performance. These headphones can pass as “in ear monitors” as well, given their compact size and tremendous quality of ambient noise reduction. They come with a durable cable that’s fairly easy to replace or customize due to the MMCX connectors, and what’s more, there’s an exquisite lock-snap mechanism which will allow you to swivel the cable for up to 360 degrees. Lastly, you’ll get a compact case as a complementary feature. Compact, small, and very powerful would be the words that best describe how Shure’s SE215-CL earphones perform in field. They come outfitted with a powerful Micro driver and provide superb sound quality and noise isolation. Furthermore, you’ll even get a free carry case. The cables of SE215 are very durable. So durable, in fact, that most people label them as “rigid”. This could be a problem if you’re bouncing a lot while you’re drumming, as they will eventually get tangled. Great for the buck, even though they do cost quite a lot. SE215-CL are easily among the most valuable, if not the best.